How I Found it: I was given Degrace's previous book, Treading Water, as a gift the Christmas before last and absolutely loved it. When I saw that she was releasing a new novel I immediately put myself on the waiting list at the library. What's it about? : The lives of several people from different walks of life all serendipitiously come together at an out of the way roadside diner one day in 1977. The premise is that the wind has blown these people towards the diner. The book is more a study in characters than a novel. Some characters, such the young and troubled Jo, are recurring, while others drift into the cafe, tell their vignette, and leave. Did I like it? : This was an enjoyable read, but I didn't love it. I think Degrace is a great writer and I really like her style. However, I found this book a little disjointed since there were so many characters to keep track of. Eventually it became clear which characters were recurring and therefore important, and which ones I could forget about. I don't give it away, but I thought the ending was both obvious and contrived. It's also worth mentioning that like Treading Water, Wind Tails has a fabulous cover. Will you like it? : If you are looking for under-appreciated Canadian authors, I think Degrace would be a great one to read. However, I think you should start with Treading Water, rather than this book. 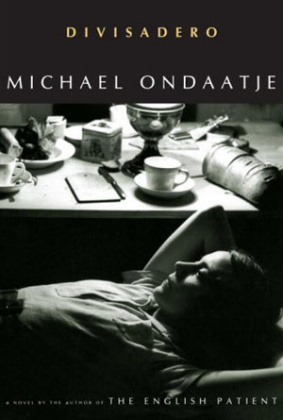 Wind Tails is enjoyable, it's just that there are quite a few contemporary Canadian novels that are a bit better. But don't take my word for it: The usual publisher's blurbs and reader reviews from Amazon, a collection of reviews on the author's website, and an in-progress review from the blog In Over My Head. How I found it: I decided to read this book when the Giller shortlist came out. However, I was on the waiting list at the library so long that Hay's book had won by the time I read it. What's it about? : This novel follows the lives of several staff members at the Yellowknife CBC radio station in 1975. The story begins as an ensemble piece and slowly explores the lives of quite a few characters. However, by the end of the book, the plot focuses on Harry, the grizzled veteran broadcaster at the tail-end of his career, and Gwen, the young self-conscious rookie. Late Nights on Air is concentrated around the social interactions of the characters, and their resulting insecurities. All of this is set against a backdrop of the Berger Inquiry into the (at the time) proposed Mackenzie Valley Pipeline. Did I like it? : I really enjoyed this book and was surprised that I had never read any of Hay's work before. The novel was very character driven, which was good, since the characters were very well written and three-dimensional. The pace of the book was a little slow, but somehow I wasn't bothered by that. I have done some research on current issues to do with the Mackenzie Valley Pipeline, so it was also interesting to see a dramatization of the issues surrounding the decision to go forward with the pipeline in the areas that would be most affected by it. I am not completely in love with this book, but I agree that it is well written and a great story, so I think it is well-deserving of its Giller win. Will you like it? : I you like good contemporary Canadian literature this is required reading. I especially recommend this book because it tackles important issues not usually seen in Canadian fiction: the realities of living in the urban North, and the environment. But don't take my word for it: The usual publisher-approved reviews and reader reviews from Amazon, a review from The Walrus, one from Vancouver's The Georgia Straight, another from The Tyee, and finally one from the blog Kailana's Written Word. How I found it: I found it in the featured local non-fiction section of the Halifax Public Library. I travelled around Newfoundland a few summers ago so this book looked interesting. What's it about? : Arms had sailed up from his home port in the Eastern United States to Newfoundland every summer for several years before the closure of the cod fishery. This book details his circumnavigation of the island by sailboat several years after the cod fishery was closed. He stops in at some of the same small fishing villages and outports and talks to old friends from previous trips. His aim is to understand and document the human face of the cod collapse. Did I like it? : I found this book fairly interesting. As a Western Canadian, I don't really know too much about the cod fishery, except that there used to be tons of cod and now there are none. I didn't really understand the effect that the collapse of cod stocks had had on Newfoundland until I read Arms' book. While the book was interesting as a study on the effects of the cod fishery, and as a sailing travelogue, I have read much better books in both veins (namely The Secret Life of Lobsters, and An Embarrassment of Mangoes). Will you like it? : For pure reading pleasure, I recommend either of the two books above over Arms' book, but if you are interested in life in rural Newfoundland, I do recommend this book. But don't take my word for it: Some reader reviews from the American Amazon, and the author's website are all I could find. How I found it: I really enjoyed Haddon's The Curious Incident of the Dog in the Night-Time and thought I should read his most recent novel. What's it about? : This novel follows the members of a dysfunctional and oh-so-English family as they prepare for the daughter's upcoming wedding. The "spot of bother" is a mysterious rash on the retired father's hip that he becomes convinced is cancer. As their patriarch, George, slips into paranoia, depression and anxiety, Jean, the mother, Katie, the newly-engaged single mom, and Jamie, the unlucky in love gay son, struggle to cope with this change in their lives, as well as their own problems. Did I like it? : From reading the description above would you believe that this book is supposed to be a comedy? In a lot of ways, this book is filled with typical English humour about usually unfunny subjects. The humour is supposed to be a counterpoint to the strife facing this family, but I mostly found the book sad, rather than funny. The book is told from the perspectives of all four members of the family and while I really enjoyed Jamie's portions, I found Katie and Jean's portions quite boring. George, the newly "crazy" dad's narratives were actually frightening to me as I witnessed first hand his descent into madness and his family's powerlessness to stop it. Compared to The Curious Incident, which I really loved, I didn't really enjoy this book. Will you like it? : If you are a true fan of English black comedy, you might like this book. However, if you've never read any Haddon before, I suggest you start with The Curious Incident since A Spot of Bother is far inferior. But don't take my word for it: The usual publisher-approved reviews and reader reviews from Amazon, a review from the New York Times, another from The Guardian, one from PopMatters, and finally one from the Literary Feline blog. How I found it: This book got a bit of buzz this summer around the same time that The 100-Mile Diet came out. I decided to read Kingsolver's book as well since it also sounded interesting. What's it about? : Kingsolver is an acclaimed novelist. She was living in Arizona with her husband and two girls when she decided that they should move to the family farm in Virginia and attempt to eat off the land as much as possible. The book chronicles their first year on the farm, including their efforts to grow fruits and vegetables, raise poultry, and make their own cheese and sausage. Kingsolver and her family were experienced gardeners before they began their experiment, and overall, it was a success. However, the book is more about a family rediscovering what it is like to live in a close-knit community and cooking together. 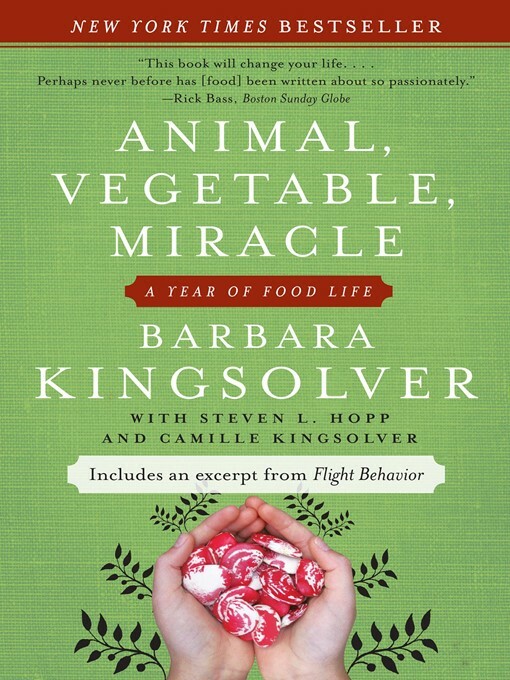 The book also contains interludes from Kingsolver's husband, Steven Hopp, about the politics of farming and food, and some brief sections from her college-age daughter Camille on nutrition, cooking techniques and recipes. Did I like it? : I didn't enjoy this book as much as I would have liked. Overall, I found that it was a cross between The 100-Mile Diet and The Omnivore's Dilemma, both of which I like more. However, it was fairly enjoyable and I felt newly inspired to grow my own food, or at least support the local farmers market. I even took Kingsolver's advice about how to make your own cheese - I checked out a book on home cheesemaking from the library and made some myself! I did find that the book was a bit preachy at times and was more about returning to a pastoral, small farming community way of life than it was about environmentalism. Not my favourite, but still excellent reading for those at all interested in food politics. Will you like it? : Kingsolver writes well and doesn't idealize farm life - she tells it like it is, and is clear that despite the hard work, she loves her life on the farm. For pure reading enjoyment, I would probably recommend The 100-Mile Diet over this book, but for practical tips on how to really eat local, Animal, Vegetable, Miracle is probably better. But don't take my word for it: The usual publisher-sanctioned reviews and reader reviews from Amazon, a review from the International Herald Tribune, one from Treehugger, an environmentalist website, another from Heavy Petal, a gardening blog, and the author's website.